SBA loan rates are set by SBA lenders (not the SBA) and can really vary depending on what the loan is used to finance as well as the quality of the transaction and the type of lender making the loan. The 504 program is used almost exclusively for commercial real estate and buildings, although it is possible to finance "long life" equipment and, in the case of a refinance, other business debt and some working capital. The 7a program can be used for "any legitimate business purpose" and is frequently used for real estate as well as business purchases. Both programs have positives and negatives and both are available as long term fixed rates from certain lenders. 504 second mortgage guaranteed by the SBA (this is the rate referenced above). The 2nd mortgage is for 30% to 40% of the total financing so 90% financing is possible. SBA 504 first mortgage interest rates were trending up but have since dropped for a few months in a row. Current rates are the 4.75% to 6.5% range depending on the quality of the borrower, the property type and how long the loan is fixed. A low 25 year fixed rate first mortgage option is available for multi-purpose properties (office, warehouse, light industrial, wholesalers, manufacturing, retail, medical office, dental office, R & D, etc) and is a great choice in the current rising rate environment. To be eligible for this particular program the property needs to be of the type that could be used by many different types of businesses. 504 first mortgage rates for properties like hotels, assisted living facilities, self storage facilities, gas station/convenience stores, bowling alleys, family entertainment centers, etc. will vary based on the quality of loan, but fixed rates are possible. SBA loan rates for the 7a program can be either fixed or variable. The 25 year fixed rate is for transactions where the majority of the loan proceeds are used for commercial real estate. The underwriting can be a little tougher than for a variable rate, but if you qualify you can lock in great rate for the long term. 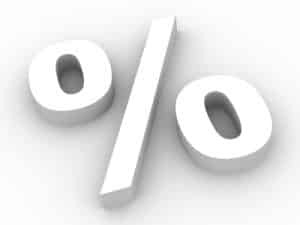 Variable interest rates are typically Prime + a margin "not to exceed 2.75%," The margin is set by the lender based on their cost of funds and the quality of the loan. Most lenders will offer something between Prime + 1% and Prime + 2.75%. 7a loans can also be based on the one month LIBOR rate. The SBA 7a is a great solution for business acquisitions as well as refinancing of business debt or partner buyouts and the rates can be fixed or variable for up to 10 years. Please contact us at 1-800-414-5285 for more information. 504 first mortgages are typically amortized over 25 years but a 30 year amortization is possible with some lenders. Rates depend on loan size, term, property type and strength of transaction. The 5 year fixed rate with a 25 year amortization is a popular product. After the initial 5 years the loan could adjust as frequently as monthly or as infrequently as every 5 years depending on the lender. April 2019 504 Mortgage Rate: 4.52%* - fixed for 25 years. (A 20 year fixed rate is also available). The combination of the 2 loans and the fact that the second mortgage is always permanently fixed make for very attractive 504 loan terms. SBA 504 Equipment Loans are typically 10 years and can be anywhere from .25 to 1.5% lower than commercial real estate transactions. SBA 504 Refinance Rates may be slightly higher and "multi-purpose" property rates are typically lower than single or special use properties like hotels or self storage properties. The low rate SBA 25 year fixed rate first mortgage option is available for strong borrowers (strong cash flow, very good credit and credit scores, etc.) financing multi-use properties under the 504 program. The loan is fixed for the entire term of the 25 yearfirst mortgage. The rates for this program are very competitive and when combined with the low rate second mortgage it makes for very attractive fully fixed long term rates. Please contact us at 1-800-414-5285 to find out how the SBA 504 or 7a could help your business. Please note: the SBA does not make loans directly and interest rates are set by the lenders who make the loans. * This is the effective rate. It includes fees to SBA, CDC and central servicing agent. Some CDC's charge higher loan rates in certain parts of the U.S. (Rates change monthly).